Here is a review of Lately to help you decide whether it would be a worthy addition to your digital marketing artillery. 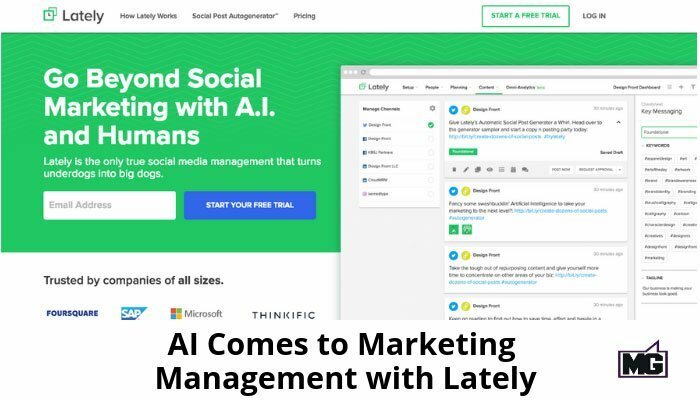 Lately is a social media management platform that combines the five main social management tools; marketing calendars, task assignment, post scheduling, content creation, and omni-analytics in one place. It is different from other social media management tools because in addition to leveraging human effort, Lately also utilizes AI to obtain insight to help build more profitable campaigns quickly. The post auto-generator is designed to help you re-purpose blogs, press releases, newsletters, whitepapers, and other evergreen content into multiple, unique social media posts. It’s one of the key areas where AI comes into play. Connect to an unlimited number of social media networks (including Facebook, Twitter, Instagram, LinkedIn, and the rest) via a single login. Thus, you can see all your varied social media world in one dashboard. This feature allows you to schedule social media posts in bulk. Therefore the posts can be scheduled to go live daily, weekly, monthly, or at any other desired frequency. If you work with a team on a spreadsheet of social posts, Lately makes it easy to upload them and schedule them all in one swoop. Social media marketers often struggle with post transcription. Lately automatically transcribes video and audio posts. Further, it can even auto-generate social media posts from the transcribed files. That’s a powerful and unique offering within this online management tool. With Lately you can identify and tag campaigns with names and descriptions. Thereafter, you can filter dashboards by campaign tags for easy tracking and management. Lately automatically organizes and stores all your important keywords including taglines, team bios, elevator pitches, and hashtags and consistently checks your posts to ensure you’re not misspelling anything. Users can create multiple dashboards and toggle between them in one click. Better still, you can create a Parent Dashboard with “Child” dashboards. A key advantage of parent dashboards is they allow you to publish content to all child dashboards at once! Among other things, Lately comes with a Campaign Dossier to collate an entire campaign. As well as a Competitive Scanner to audit keywords and content. The Influencer Analyzer helps you discover the best influencers in your industry and a Report Generator helps you quickly generate customized reports. Other top features to look forward to including a link manager, multi-channel publisher, multi-dashboard publisher, RSS feed manager, marketing calendar, task manager, goals reminder, activity digest, and contacts manager. Enterprisely: This is the most advanced plan. Call for pricing. Lately customer support has a goal of being exceptional. Aside from 24/7 live support, clients have access to email and also phone support. There are also EBooks, live webinars, and a dedicated Help Center, all created with the sole purpose of assisting, educating, and empowering users. Microsoft is a user of the platform. So it’s got some big companies that have joined in and see it’s value. If you want to go deeper and use some of the latest in AI technology to improve your efficiencies, Lately is worth a look for sure.